When we replace the flares on Archimedes, the old flares are moved to the dinghy. It is a good use for the expired flares from the big boat. 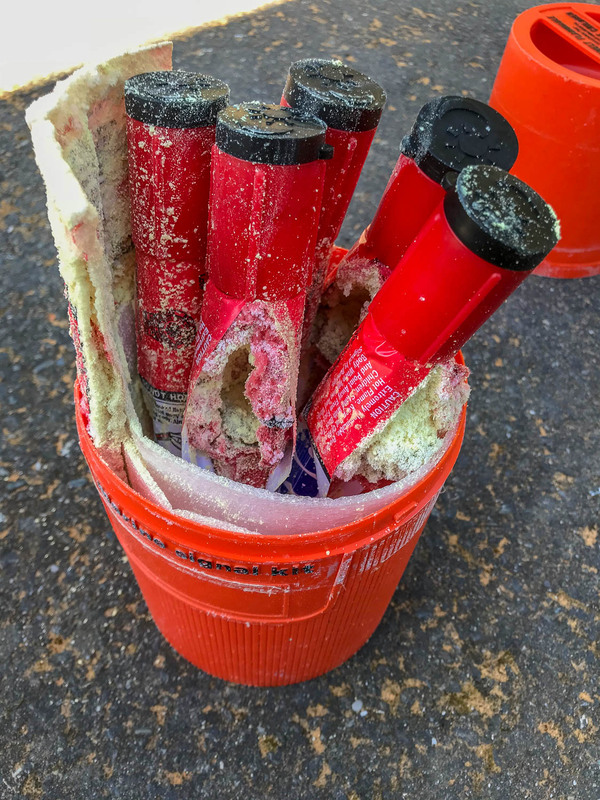 There is no requirement to keep flares on our dinghy, but it always seemed smart to keep safety equipment aboard. This is what I found when I opened the canister, though. I admit, I haven’t checked these flares since we swapped them out three years ago. Sure looks like moisture got to them. I need to a) check the condition more frequently, and b) store them somewhere dry when we are not using the dinghy. For more information on safety requirements and pyrotechnic visual distress signaling devices, check out the Coast Guard’s handy Boaters Guide to The Federal Requirements for Recreational Boats. Flares are discussed on pages 16-20. This entry was posted in Gear, Interesting, Safety and tagged Archimedes, Coast Guard, Flares, Grand Banks, Grand Banks 42, Pacific Northwest, Poulsbo, Safety, Salish Sea, Trawler by Rusty. Bookmark the permalink.